Objective Many patient deaths have been reported because of administration of contaminated intravenous medicines due to incorrect aseptic techniques. Our aim was to review the literature for (1) incorrect practices in aseptic drug preparation and administration and (2) recommendations for safer practices in hospitals. Methods A systematic literature search was conducted in PubMed covering 2007–2015. Studies were included if they concerned aseptic medicine preparation and administration in hospitals by different healthcare professionals, assessed incorrect practices and made recommendations for safer aseptic preparation and administration. Results 26 studies were included of which 19 were original articles. 12 of the studies concerned description of incorrect practices that led to contamination. The studies reported 11 incorrect practices that increased the risk of contamination of parenteral medicines. The most reported incorrect practices were multiple use of phials and syringes (2/12 studies) and lack of overall disinfection during the aseptic preparation and administration (3/12 studies). 22 practices were recommended to avoid contamination, which were classified into six categories: equipment and medicines (7); disinfection (6); working environment (3); storing (3); catheter care (2) and quality of prepared medicines (1). The results indicate that pharmacists prepared syringes with less contamination than nurses because of the pharmacist's aseptic skills and environmental aspects in pharmacy units. Conclusions The review discusses many appropriate and enhanced practices in aseptic drug preparation and administration. As the change for the better in contamination rates of administered medicines seems to be challenging to achieve in hospitals, better and possibly international procedures for safe parenteral practices need to be developed. Administration of contaminated intravenous medicines due to incorrect aseptic techniques has been a contributing factor to many of the patient deaths that have been reported.1 ,2 Healthcare-associated infections are a significant cause of harm to patients and add remarkably to the healthcare costs all over the world.3 Intravenous therapy is a complex process sometimes requiring the preparation of a medicine in the hospital pharmacy premises or on the ward before administration to the patient.4 Thus, the preparation phase is posing a potential risk for microbial contamination. Therefore, aseptic techniques must be used when handling sterile starting components for the preparation of medicines for parenteral administration in order to reduce microbial contamination risk.5 Aseptic techniques are methods designed to prevent contamination from microorganisms. These techniques require application of the strictest rules and best knowledge of infection prevention in order to minimise the risks for infection. Common settings where aseptic techniques for preparation of medicines are needed include surgery rooms and clinics in hospitals, pharmacies and drug industry. According to a previous study, medication errors are common related to the parenteral medicines in hospitals.4 At least one deviation from the aseptic techniques was observed among 19%–100% of intravenous drug preparation and administration cases of that study.4 Aseptic techniques alone cannot guarantee that a sterile dose will ultimately be prepared, because environmental contamination can occur during the preparation and administration. It is often argued that aseptically prepared medicines for parenteral administration should be made in a controlled environment in a pharmacy department, where the risk of environmental contamination is lower than in the clinical environment.6 However, there is little evidence to support this argument. The above-mentioned two systematic reviews by Austin and Elia5 ,7 compared the contamination rates between the different environments, but they did not focus on the different aseptic techniques applied to the preparation of parenteral medicines. The aseptic techniques can differ in many ways, for example, by practices related to working area, personal hygiene, reagents and media and handling. The aim of this systematic study was to focus on these different aseptic techniques in order to identify (1) incorrect practices in aseptic medicine preparation and administration and (2) recommendations for safer practices in hospitals. 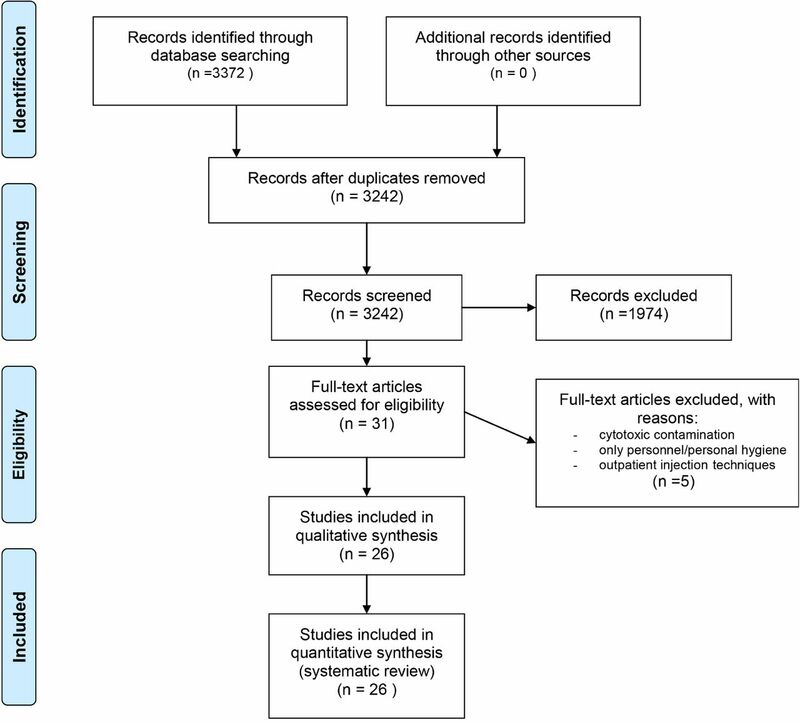 A systematic review based on the literature search in PubMed covering years 2007–2015 was carried out (figure 1). The quality of included studies was assessed using the GRADE system. Search strategy for PubMed indicating the used search terms and their combinations. A systematic literature search was conducted in PubMed covering the period from January 2007 to April 2015. This period was chosen as we wanted to focus on the most recent evidence published in peer-reviewed journals and indexed in PubMed. The search strategy, search terms and search engine from the first systematic review by Austin and Elia5 were applied. Studies were included if they concerned aseptic medicine preparation and administration in hospitals by different healthcare professionals, assessed incorrect practices and made recommendations for safer aseptic preparation and administration. Our inclusion criteria covered microbiological contamination (bacteria or fungi) of all parenteral products when prepared or administered to patients (also cytostatics and parenteral nutritions) in inpatient care. We also included letters, editorials and commentaries from peer-reviewed journals because they reflect ongoing scientific debate on important issues at the time of publication. The exclusion criteria were studies not published in English, all animal studies and studies which covered food. In short, the following PICO (P – Populations/People/Patient/Problem, I – Intervention(s), C – Comparison and O – Outcome) was applied in this study: Participants (different healthcare professionals), Intervention (aseptic medicine preparation and administration), Comparison (different environments/different aseptic techniques/different professionals; not required) and Outcomes (appropriate and incorrect practices in aseptic preparation, and medication safety). All searches were merged (figure 1). The search resulted in a total of 3242 references after duplicates were removed (figure 2). There were 3099 references after the exclusion of studies not published in English, 1326 after the exclusion of animal studies and 1268 after the exclusion of studies on the contamination of food. The title of each of these 1268 references was evaluated by one author (ES-P), and after excluding those that were irrelevant to the topic under investigation (eg, those dealing with stability or drug effectiveness) or whose title had not clearly stated the real subject, 102 references were left. After data extraction by title review, the abstracts of all 102 references were evaluated for relevance by one author (ES-P), resulting in 31 references. A review of the full text of each of these was carried out independently by two authors (ES-P and SH). Disagreements between the reviewers were resolved through discussion. Studies were retained only if they clearly met the inclusion criteria. From included studies, we searched the incorrect practices and recommendations for safer practices in aseptic medicine preparation and administration in hospitals. The following issues of the included studies were analysed: contamination rates of prepared and administered medicines; impact of the environment on the contamination rates; typical medicines to prepare aseptically; the method for microbiological analyses and the appropriate and incorrect preparation and administration practices. We classified the practice to be appropriate if there was a guideline, recommendation or research result that was referred in the study to support the use of the chosen practices to avoid contamination. Likewise, we classified the practice to be incorrect if the included studies showed microbial contamination when using this practice. Based on this analysis of the included studies, we classified the incorrect practices found and the recommendations for safer practices into different categories. We made the description of each practice according to the evidence provided in the studies. This systematic review is based on 26 peer-reviewed articles, of which 1910–28 were original articles with empirical results (see online supplementary appendix 1). The key findings of the review are reported in table 1. The settings of the included articles are presented in online supplementary appendix 1. Twelve of these included articles dealt with incorrect practices and recommendations to avoid contamination.10–12 ,16 ,18–20 ,24 ,26 ,27 ,29 ,30 Thus, these were the key studies that provided empirical evidence to our research questions. These 12 studies concerned reasons for incorrect practices; description of incorrect practices that lead to contamination and recommendations to avoid contamination. The majority of the included articles (69%, n=18) were graded as low quality because they were non-randomised. Three of the original articles and all of the letters (n=2),31 ,32 editorials (n=1)29 and commentaries (n=2)33 ,34 were graded as very low quality because they were, for example, guidelines in their nature without empirical evidence (see online supplementary appendix 1, Objective and Study design). Sigward et al25 studied the aseptic technique of pharmacy practitioners with aseptic simulation test where all septa of the phials to be manipulated were contaminated. The aseptic simulation test or media-fill test procedure uses a sterile microbiological growth medium (tryptone soya agar) in place of the drug solution to test whether the aseptic practices are adequate to prevent contamination during actual drug production. Usually, the test is done annually in the pharmaceutical industry and in hospital pharmacies.25 Sigward et al25 showed in their study that when a pharmacy practitioner used a correct aseptic technique they passed the aseptic simulation test. They also showed that the microbiological growth in the simulation test directly correlated to erroneous handling and a poor aseptic technique. Austin and Elia10 showed that pharmacy practitioners achieved a significantly lower syringe contamination rate than nurses and the main reason for that was training and experience that was based on education.10 Isanhart et al22 showed that among pharmacy students an improved aseptic technique reduced the rate of microbial contamination. Training and experience were associated with different operational procedures. The stages of aseptic techniques are presented in table 1, of which the most important are disinfection and catheter care. We found three studies which concerned the multiple use of syringes, phials and ampoules.12 ,16 ,19 A single-dose or single-use phial and syringe are a dosage forms of liquid medication intended for parenteral administration (injection or infusion) that are meant for use in a single patient for administration of a single dose. Single-dose or single-use medicines do not typically contain an antimicrobial preservative and they are licensed solely to be used as a single dose or for single use. The microbial contamination can occur after the first penetration of the single dose. 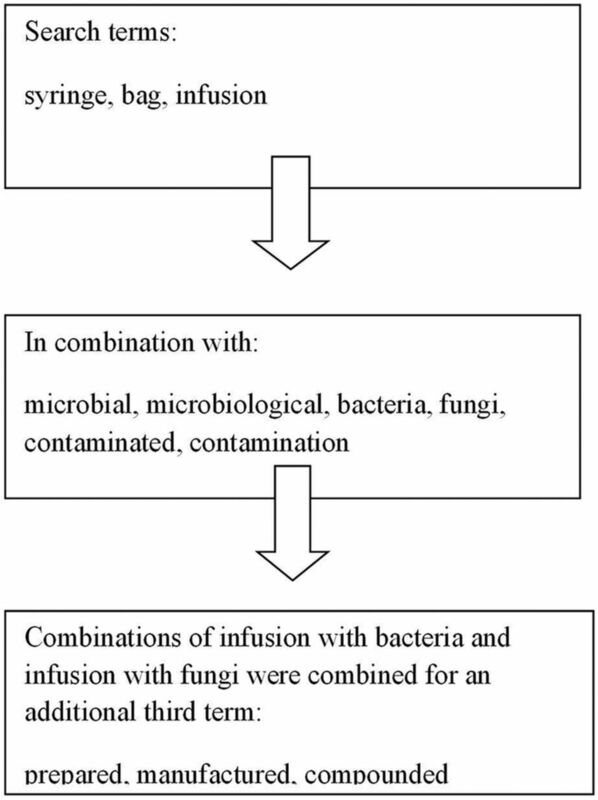 Two of the included articles reported outbreaks resulting from healthcare personnel using single-dose or single-use phials for multiple patients.32 ,34 The multiple use of syringes, phials and ampoules (table 1) for more than one patient increases the risk of microbial contamination.18 The multiple use is a practice where the same syringe, phial or ampoule is used for more than once and on more than one patient.18 The multiple use of prefilled syringes has been imagined to save time and to be more effective. Buerke et al12 showed that the time of assembly of the injection system and installation of prefilled syringes did not differ significantly between the single use protocol and multiple-use protocol and there is the risk of bacterial contamination with multiple use of syringes.12 Many studies on injection practices show that physicians are not aware of the risks of multiple use of syringes.32 ,34 A survey of 550 healthcare professionals found that 1% of clinicians reported sometimes reusing syringes and 6% reported reusing single-dose phials.35 According to Cozanitis and Mäkelä,32 syringe reuse is a very common practice among anaesthetists. Rosenberg et al36 showed almost 40% of anaesthetists admitted to multiple use of syringes. Twenty-two recommendations were found for safe practices to avoid microbial contamination in different operational procedures (table 1). They were categorised into the following six key recommendation categories: disinfection (six recommendations); catheter care (two recommendations); equipments and medicines (seven recommendations), storage (three recommendations), working environment (three recommendations) and quality of prepared medicines (one recommendation) (table 1). This systematic review found 11 incorrect practices that increased the risk of contamination of parenteral medicines. The most reported incorrect practices were multiple use of phials and syringes and lack of overall disinfection during the aseptic preparation and administration. Twenty-two practices were recommended to avoid contamination. Most of the recommendations relate to categories disinfection and equipments and medicines. The results indicate that pharmacists prepared syringes with less contamination than nurses because of the pharmacist's aseptic skills and environmental aspects in pharmacy units. Based on the data extracted from the included studies, it is indicated that pharmacy practitioner's aseptic skills are better than those of nurses10 and environmental (laminar-airflow hood in a cleanroom, drug preparation area in hospital ward or uncontrolled decentralised pharmacy in a ward) aspects in pharmacy units are cleaner than in wards.26 The most likely reason for differences in contamination rates between nurses and pharmacists concerns their respective training and experience in aseptic techniques.10 In the hospital wards, the medicine preparation is often performed in patient rooms, without any protective wear,19 while in the hospital pharmacies the preparation is done in cleanrooms with regulating protective wear. Environmental standards and preparation practices in hospital wards are variable. There are no national standards for ward-based aseptic preparation, while the preparation in hospital pharmacies is well instructed.10 Therefore, the demand for making parenterally used medicines in a pharmacy department is well founded. Recent research has started to pay attention to the aseptic techniques for all administration procedures and infusion solution/medication preparation, after incorrect aseptic techniques and environmental aspects have been identified.15 ,21 As a result, to prevent contamination and bloodstream infections, checklists and safety tools have been developed and used.21 ,15 The compliance of hospital staff with the given rules is often poor.15 De Giorgi et al 15 showed, based on a pharmacoeconomic analysis, that the involvement of a clinical pharmacist is one of the most cost-effective interventions in reducing microbiological contamination in patient care. We exploited the previous systematic review and its search strategy.5 We also intentionally used only PubMed as a search engine as we wanted to repeat the literature search by Austin and Elia,5 but wanted to take another approach by identifying incorrect aseptic techniques and practices that lead to contamination in preparation and administration of parenteral medications. The data extraction by titles and abstracts were conducted by one author, which has potential for a selection bias,9 in selection of which studies to include in review to present the most significant result. In turn, two authors evaluated the full texts, which improve the reliability of the synthesis of the evidence. The included studies applied different study designs and protocols, as well as different measures and indicators to assess the possible contamination of parenteral preparations, which make it difficult to compare and generalise their findings. Protocols in most of the included studies were designed for ward-based or pharmacy-based aseptic preparation in such a way that aseptic practices were seen as the only leading cause to contamination. Therefore, the possibility of manufacture-based contaminations might have been overlooked. Our study provides the most current evidence on safety risks and possible ways to minimise the risks in aseptic preparation and administration of medicines in hospitals. Our review found differences in contamination rates between different healthcare workers in preparing medicines as has been found in the previous systematic reviews (Austin and Elia5 and and Austin et al7). We also found many incorrect aseptic techniques and practices that should be avoided and many good techniques and practices that should be used instead. The new safer techniques and practices, for example, disinfection and hygiene aspects, should be implemented and taught to healthcare practitioners, particularly to nurses. As the change for the better in contamination rates of administered medicines seems to be challenging to achieve in hospitals,7 better and possibly international procedures for safe parenteral practices need to be developed. This systematic review identified many incorrect and unsafe practices and disregarded given rules in aseptic preparation and administration of parenteral medicines. This study indicates that current preparation and administration systems for parenteral therapy do not minimise patient safety risks. As a consequence, both theoretical knowledge and practical skills required in safe preparation and administration of parenteral medications should be improved among healthcare practitioners. As the change for the better in contamination rates of administered medicines seems to be challenging to achieve in hospitals, better and possibly international procedures for safe parenteral practices need to be developed.
. Lessons from the investigation into intravenous fluid-related neonatal deaths. S African Med J 1992;81:397–8.
. Quality assurance of aseptic preparation services. 4th edn. Pharmaceutical Press, 2006;107.
. Infusion nursing in the US: trends and challenges. Br J Nurs 2013; 22:S3.
. Risk management, cGMP, and the evolution of aseptic processing technology. PDA J Pharm Sci Technol 2009;63:8–10.
. Unsafe injection practices plague US outpatient facilities, harm patients. JAMA 2012;308:2551–2.
. Accidental needlesticks: do anesthesiologists practise proper infection control precautions? Am J Anesthesiol 1995;22:125–32.
. Centers for disease control guidelines on infection control: guidelines for prevention of intravascular infections. Atlanta: Centers for Disease Control, 1981. PB84-923403. Contributors The following contributorship statement applies to each author of this manuscript: substantial contributions to the analysis of data for the work; revising the work critically for important intellectual content; final approval of the version to be published; agreement to be accountable for all aspects of the work in ensuring that questions related to the accuracy or integrity of any part of the work are appropriately investigated and resolved. Funding Eeva Suvikas-Peltonen was supported by the state research funding granted by Satakunta Hospital District when completing the review.